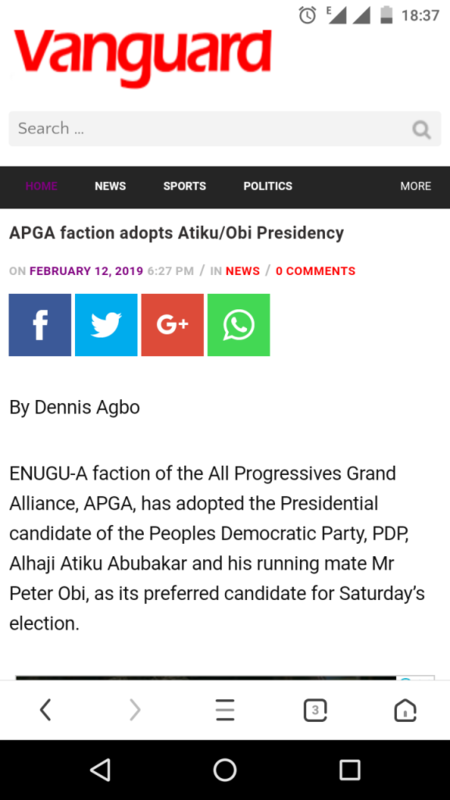 A faction of the All Progressives Grand Alliance, APGA, has adopted the Presidential candidate of the Peoples Democratic Party, PDP, Alhaji Atiku Abubakar and his running mate Mr Peter Obi, as its preferred candidate for Saturday’s election. The APGA members; consisting mainly of State Chapter Chairmen and led by Chief Jerry Obasi, in a meeting in Enugu, Tuesday, said they saw the need to join forces with other progressives to rescue the country. Obasi said they were impressed by Atiku’s pledge to restructure the country and make the economy work again, while providing jobs and wealth creation. The APGA faction also extolled the Ohanaeze Ndigbo, Pan-Niger Delta Elders Forum, PANDEF; Afenifere and the Middle Belt Forum for their wisdom in supporting the PDP candidate. Obasi said “We can’t allow APGA to be destroyed by strangers that invaded our party. Some people claim that they are the leaders of APGA, but they are at a different place while the soul of the party is somewhere else. Former Minister of State for Foreign Affairs; Chief Dubem Onyia who accepted the letter of adoption, on behalf of Atiku, applauded them for offering to partner the PDP candidate in the struggle to reclaim Nigeria. He assured that Atiku would not disappoint Nigerians if elected because he has enormous experience to turn the fortunes of the nation around.